Pianist Rob Hoeke started his first band in 1957 with his brother Paul (d) and Ed Heck (upright bass). In 1959, they became the Rob Hoeke Boogie Woogie Quartet, adding guitarist Wim Bitter. By the time they got a recording contract with Phonogram's Philips label, Ed Heck had been replaced by a bass guitarist, Kees Kuypers. In October 1963, they released their first record (an EP), followed in 1964 by an LP, "Boogie Hoogie". Early 1965, the band did a stint in Sweden. Upon their return, they recorded the single, "Down South", which would become Hoeke's signature tune. After a second trip to Sweden and sitting in on the piano with The Rolling Stones, Hoeke switched to R&B, renaming his band Rob Hoeke R&B Group and adding cousin Frans Hoeke (v, g). Late 1965, Wim Bitter was replaced by John Schuursma (later in Brainbox). The band had their first hit with "Margio" in mid-1966, after which they were joined by Willem Schoone (b, v, ex-Marks). Schoone sang lead on the next hit, "When People Talk". Shortly after that, Rob’s brother Paul Hoeke quit and was replaced by drummer Martin Rüdelsheim. This line-up recorded the successful album, "Save Our Souls". The band had two more hits in 1967 and by 1968's "Drinking On My Bed" (the last hit of the R&B Group), Schuursma had been replaced with Will de Meyer (g, ex-Alleycats). Not long afterwards, Frans Hoeke quit to pursue a solo career, which would turn out to be quite unsuccessful. For a while he was not replaced. As the single "Down South" from 1965 was still very popular, Rob was asked to do a new boogie-woogie album. So in mid-1968, two Rob Hoeke albums hit the shops: "Celsius 232.8" by The Rob Hoeke R&B Group (Hoeke, Schoone, Rüdelsheim & de Meyer) and the instrumental "Robby's Saloon" by the revived Rob Hoeke Boogie Woogie Quartet (Rob Hoeke, Paul Hoeke, Will de Meyer and Kees Kuypers). 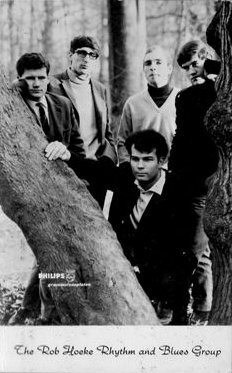 Then some more changes took place: shortly after the release of "Celsius" in late 1968, Jan Vennik (o, s, ex-Motions) came in as a fifth member. In the Spring of 1969, Jaap Jan Schermer became the new drummer. After the success of "Robby's Saloon", Hoeke recorded another boogie-woogie album, "Racing The Boogie", in early 1970 (and Phonogram included the 1965 track "Down South" on it to boost sales). This move didn't do Hoeke's reputation much good as there was confusion over what to expect from him: psychedelic bluesy rock or boogie-woogie. The situation would not be helped by "Down South" being re-released as a single and hitting the charts. It effectively meant the end of the Rob Hoeke R&B Group. In March 1970, Schoone left to be replaced by Guus Willlemse (ex-Truce, later in Solution), but the writing was on the wall, especially since Rob Hoeke didn't even play on the next single, "Next World War" (Vennik played the keyboards). The following single, "Everybody Tries", hit the lower regions of the charts, but after that the R&B Group and the Boogie Woogie Quartet would be interchangeable. In 1971, Hoeke recorded a piano duo album with old friend Hein van der Gaag, assisted by Ben de Bruin (g), Paul Lagaay (d) and Will de Meijer (b). Pim van der Linden (ex-Het and Pocomania) then came in on bass with de Meyer reverting to guitar. The 1972 album, "Full Speed/Ten Years From Countdown", was recorded with Ben de Bruijn, Paul Lagaay and bassist Herman Deinum (ex-Cuby + Blizzards). Hoeke then started fulfilling his contracts with the returned Martin Rüdelsheim and Martin Schoon (b). In the meantime, he started rehearsing with Eelco Gelling and Harry Muskee of the disbanded Cuby + Blizzards, but the project didn't work out. Hoeke then decided to get back his cousin Frans and guitarist Ben de Bruijn, plus the C+B rhythm section - Herman Deinum (b) and Hans Lafaille (d). This line-up recorded the 1973 album (credited to "Rob Hoeke"), "Rockin' The Boogie". Early 1974, Hoeke's band comprised de Bruijn, the returned Pim van der Linden (b, replaced by Ed Swanenberg, ex-Unit Gloria), Will Baltus (d) and Brenny van Rosmalen (v, g). Then tragedy struck: while trying to fix his car, Hoeke injured his left hand (hit by a fan), losing most of his left pinky and ring finger. The days of playing piano seemed to be over. Yet in 1975 he managed to record another duo album with Hein van der Gaag, called "Fingerprints". Slowly Hoeke managed to get used to playing with "less hand" than before. Later that year, he started touring again with Ben de Bruijn (replacing Eef Albers), Ab de Jong (d, ex-Mantra Energy), Chiel Pos (ex-Beehive, g, s, v) and Fred Snel (b, ex-Solar). In early 1976, Hoeke reverted back to a trio with Pos (now on bass) and (again) Martin Rüdelsheim (d), and the next year - with John Schuursma (b) and Maarten van de Valk (d). In the Summer of 1977, Hoeke recorded an album with Alan Price. In early 1978, he chose bluesers Railway as his backing band, comprised of Rob Goedkoop (g, v), Jacques Groen (d) and Doewe Munk (b). For the next album, "Boogie Woogie Explosion", Hoeke picked ex-Focus-drummer Pierre van der Linden, plus former members Will de Meijer (g, b), John Schuursma (g, b) and Jan Vennik (s). On the 1981 album, "Home Made", Hoeke kept van der Linden and Vennik, adding former members Willlem Schoone (b) and Ben de Bruijn (g). In 1983, Hoeke started playing with a band again as The Rob Hoeke Group (keeping a label in the middle, whether it was R&B or Boogie Woogie). In the 1980s, Hoeke used a kind of floating line-up with interchangeable drummers (Paul Lagaay, Rini Roukema) and bass players (Fred Snel, Jan de Jong, Gerard Biersteker, Willbert de Gooijer) and alternating between trio and quartet line-ups. From mid-1984 on, old soldier Will de Meyer (g, v) was mainly there when the four-piece played, but many guests and old band members appeared in the line-up from time to time, like John Schuursma and Pierre van der Linden. And from 1987 on, he played under the band name of Rob Hoeke's Boogie & Blues Band, while keeping his flexible line-ups. Highlights were four concerts at the North Sea Jazz festival within the space of 10 years. In the latter days of his career, Hoeke toured with a remarkably stable line-up comprising Paul Lagaay (d), Chiel (Michiel) Pos (v, g, s) and Toon Segers (b), who'd all played with him before. From 1998 and until the very end, Hoeke (apart from his band gigs) toured Dutch theatres with fellow boogie pianists Jaap Dekker and Rob Agerbeek as The Grand Piano Boogie Train. When it was announced Rob Hoeke was terminally ill, he did a farewell concert in August 1999 with many of his former sidemen and his sons Ruben (leader of his own blues-rock band) and Eric sitting in. Rob Hoeke died in late 1999 at the age of 60.